If you're around and about the city of Los Angeles on Sunday, August 8, you have a chance to saddle up and ride with the Rhone Rangers at their Southern California tasting event. This is always one of my favorite tastings because it provides an opportunity to meet some of the friendliest, most talented folks in the wine biz and taste a wide range of wines made with Rhone varieties. Over 35 wineries will be there, including some familiar to readers of GWU$20 like Anglim, Cline, Four Vines, Tablas Creek, and Unti. These producers deliver exceptional value for the money, and if you attend you'll walk out with a real knowledge of what appeals to you for your next trip to the wine store. Artisan cheeses and tapas plates will be available for purchase from 2-5. Time: 2-5 PM, General Admission. Tickets, $35. 12-5 PM VIP Admission, Tickets, $75. Wine: Participating wineries include: 10 Knots Cellars, Anglim, Calcareous, Caliza, Cass, Chateau Ste Michelle, Clavo Cellars, Cliff Creek Cellars, Cline, Columbia Crest, Curtis, Derby Wine Estates, Ecluse, Edward Sellers, Epiphany, Fess Parker, Four Vines, Halter Ranch, J. Lohr, Jada, Justin, Katin, L'Aventure, Michael-David, Ortman Family Vineyards, Qupe, Stark, Tablas Creek, Tercero, Terry Hoage, Treana, Unti, Vina Robles, Vines on the Marycrest, Zaca Mesa. Food: Complimentary appetizers and tapas plates will be served by Schaffer's Genuine Catering, Venice, CA, from 12 noon - 2 PM. From 2 PM - 5 PM, tapas plates will be available for purchase. Sometimes, I can be very ornery. When there's lots of hype, I think, "Nothing is THAT good." Memorable occasions when I've been proven wrong were Chariots of Fire (still one of the best movies ever made) and Harry Potter and the Philosopher's Stone (goes without saying). There's a rosé that's been getting a fair bit of hype lately, and when I saw a bottle of the latest vintage on the shelf at my local grocery store, I had to give it a try. I'm glad I did, because it turns out the hype was merited. 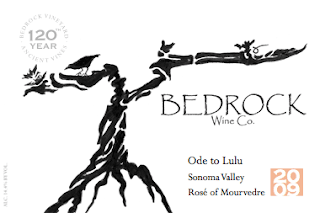 The 2009 Bedrock Wine Co. Ode to Lulu Rosé is a lusty, zaftig rosé that may make you hum Ode to Joy. ($19.99 in my local independent grocery store; available elsewhere for $17-$22) As I sipped this, it seemed to me that the high points the previous vintage received from major wine magazines might actually be a bit stingy. There were very dry aromas: just a waft of strawberry wrapped around lime zest and chalk. I got no watermelon candy taste at all--something I taste in a lot of rosés these days. Instead, there was strawberry fruit, with a lovely stoniness that kept it focused. This wine left a beautifully rich taste in the mouth, a nice nod at the Mourvedre grapes that went into the bottle. Excellent QPR. Given its rich, dry flavor profile the Bedrock Wine Co.'s Ode to Lulu can stand up to a wide variety of summery fare, from BBQ ribs to grilled tuna salade niçoise, and from hot dogs to peel-and-eat shrimp with zesty cocktail sauce. I'm writing from the Sonoma Coast appellation as I often do this time of year, and it wouldn't be proper if I didn't include a post about the coast's favorite grape: Pinot Noir. Today, I'm highlighting the versatility of the grape by writing about a traditional red Pinot Noir, as well as a rosé made with the grape--and both are under $20. In addition, I'm tipping you off about what just may be the best value in Pinot Noir. Period. It is a little pricier than most wines I review here at just under $30, but drinks like a wine that is easily twice or perhaps even three times the price. First up, we have the 2007 The Other Guys Pinot Noir Moobuzz ($17.99 in my local independent grocery store; available for $11-$18) Underneath a truly bizarre closure that must be peeled and then tugged, this wine goes through an awkward stage when first opened, when I detected a strong note of acetone in the aromas. It settles down quickly, though, to more appealing aromas of red raspberries, huckleberries, a touch of high-toned pomegranate. These red fruit aromas are evident in the flavors as well, along with additional earthy and spicy notes (especially baking spices like allspice, cloves, and cinnamon). A decent food wine, think of this when you're serving some grilled salmon this summer. Very good QPR. For another very good QPR Pinot Noir, think pink. The 2009 Fort Ross Pinot Noir Rosé from nearby Fort Ross Vineyard is a delicious wine that expands your sense of the grape into the land of affordable summertime sippers. ($11.99 in my local independent grocery store; available elsewhere for around the same price) The wine is surprisingly dark in color--a rich, deep tea rose--but the aromas and flavors are quite dry and laced with mineral notes. You will find strawberry and herbal flavors and aromas, too. The aftertaste is dry, but retains its mouthwatering juiciness. And finally, I recommend the excellent QPR 2008 Cep Vineyards Pinot Noir Sonoma Coast. ($25.99 in my local independent grocery store; available elsewhere for $23-$31) It used to be something of a hush-hush matter that this was Peay Vineyard's second label, but it's all over the web now. This is perhaps the best value in under $30, made by talented winemakers with some amazing fruit that just wasn't quite up to their high standards. This wine is quite young at present, which translates into "quite spicy" so give it some time in a cool dark place or some time to open up before you drink it now. (It would be a lovely wine for holiday dinners in November and December, by the way). Its raspberry, orange peel, clove, and allspice aromas and flavors are scrumptious and a perfect lead in to the flavors that follow. As wine opened there were mineral, cinnamon, and herbal notes, too. This wine is very complex for the price, and with a classic--and classy--Sonoma Coast profile. Those of you who come to the website, as opposed to those who get this through a feed reader, will have noticed the site has a new look. It was time for a dusting off and a change, and I hope you like it. As part of the update, I've installed some new "reactions" and "share" buttons at the bottom of each post. They provide an opportunity for you to agree or disagree with my take on a wine (if you've tasted it, too) and to indicate that the review sparked your interest in a wine ("wish list"). There are also handy buttons to share a post with your friends on Twitter, Facebook, and other social media sites. Thanks for your continued readership. GWU$20 has more than 8000 daily subscribers and nearly 500,000 people have stopped by since the site went live in October 2006. Sparkling wine is one of life's greatest pleasures. Regular readers know how fond I am of wine with bubbles in it, and I'm always on the lookout for new ways to bring some into the house without breaking the bank. So when Jill at domaineLA mentioned she had a new sparkling Riesling on the shelves, I decided to give it a try. 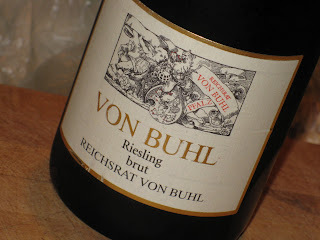 The 2008 Reichsrat Von Buhl Riesling Brut [Sekt] is a dry wine with piercing apple aromas and hints of petroleum around the edges which is characteristic of Rieslings from this part of the world. Abundant yet fine bead gives the wine a nice texture that is lively without being harsh or raspy. You will find flavors of yeast, bread dough, and apple as you sip and the aftertaste left in your mouth will draw you back for more. A fun sparkler for $25, with lots of class and very good QPR. I think you could easily open this bottle when you are tempted to splurge on a French champagne, given its classic flavor profile. I know that there is no such thing as a "correct" wine pairing, and that the only thing that really matters is what works for your tastebuds. Nevertheless, I do enjoy the alchemy of good wine and food pairings--that semi-mystical thing that happens when the two hit it off perfectly. Many of us have figured out over time what favorite foods work with our favorite wines: oysters with Champagne, Gewurztraminer with Thai food, Merlot and hamburgers. But what do you serve with Arneis? How about Xinomavro? If you are into grape adventures, and often pick up wines made with unfamiliar, unpronounceable grapes then you are left in the kitchen contemplating a wine you've never tasted before and wondering what to eat with it. 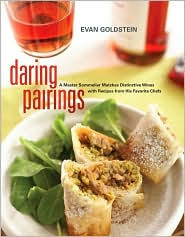 Enter Evan Goldstein and Daring Pairings (University of California Press, $34.95; available on Amazon.com and at other retailers for $23 and up). The subtitle reads "a Master Sommelier matches distinctive wines with recipes from his favorite chefs" and this book delivers on that promise. I'm a member of the Wine Century Club, so I'm always on the hunt for new grapes. Many of my favorites are profiled in this book from the increasingly common (Albarino, Malbec, Tempranillo) to the still rare (Trebbiano, Tannat, Aglianico). The book is arranged in two sections (white grapes, red grapes) and then alphabetically by grape. Each grape gets an excellent, readable description, cheese pairing advice, and a tasty recipe. In some pairing books that include recipes from chefs, the recipes are so complicated you never get around to making them. Not so this book. I immediately made a terrific pasta dish dreamed up by the Union Square Cafe's Michael Romano with asparagus, prosciutto, and roasted peppers to accompany that wonderfully weird Bordeaux I had last week. A few days later, I made Charlie Trotter's salad of Cornish game hens with Shitake Mushroom Vinaigrette. Both were delicious, neither was too complicated--and were wonderful with the recommended wines. I highly recommend this book. It's fun to read, and Goldstein wears his obvious expertise lightly. There is nothing intimidating about this book, but it still offers new wisdom to wine enthusiasts who know a little bit about wine. It's fun to go to the wine store with a list of funky grapes you now want to try. And it's fun to head into the kitchen to whip up a sophisticated dish to go with your first sip of Txakoli, confident that the two will taste great together. Full disclosure: I received a review copy of this book. So, how are your purchases of 2009 Bordeaux futures coming along? If, like me, you decided to sit out the hysteria this year (the prices are epic and the hysteria just as epic), you may be feeling a little blue. For me, its budgetary. I just don't eat enough of the kind of food that goes with a fantastic bottle of aged Bordeaux to warrant the splurge. Riesling or Champagne? That's another matter. It's not that I don't like the taste of Bordeaux wines--I do. But I think I've got enough 2003 bottles in my cellar (none of which will be ready to drink for another few years) to keep me going. Meanwhile, if you are watching/listening/participating in the 2009 Futures Follies, you may want a nice bottle of Bordeaux to go with it. Here are two bottles--one unusual bottle from Bordeaux and one Bordeaux-like bottle from California--that will help see you through the process. The first bottle I'm recommending is the 2007 Château Tire Pé DieM ($7.99, Garagiste; available currently for $10-$14) This is not your father's Bordeaux, but it's just fantastic. Imagine, if you will, the vinous love child of a wine from Bordeaux and one from the Beaujolais and you've pretty much got this wine. It's a classic blend of Merlot, Cabernet Franc, and Cabernet Sauvignon that oozes personality and old world charm but is much lighter in weight than most bottlings from this part of France, which tend to be heavy, complex, and age-worthy. The first impression of the wine is crushed raspberries, some soil, and some rocks--very Beaujolais, in my book. The feeling of the wine is silky in the mouth. Then the funkier notes kick in, along with some vegetal greenness, some spice, and a hint of pencil lead--all very Bordeaux. And it's a terrific excellent QPR buy that certainly constitutes a great candidate for a house red (and when was the last time you said THAT about 2007 Bordeaux??) For food pairings, think of any foods you would pair with Gamay or Cabernet Franc, such as roasted chicken, sausages, or pork. 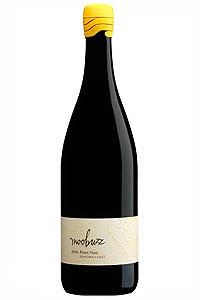 If you are looking for a heavier, more complicated wine made with true Bordeaux style, reach for the 2007 Trefethen Double T (available for $16-28) from the Napa Valley. I was extremely pleased with this blend that includes all five classic Bordeaux varieties. The wine was unusually complex for an excellent QPR bottling, with cassis, plum, and tobacco leaf aromas. Layered cassis, graphite, and herbal notes are present in the flavors, with a juicy aftertaste that lingers long enough to invite you back for another taste. Excellent with heartier fare, like this molasses/mustard marinated pork tenderloin. Full Disclosure: I received the Trefethen Double-T as a sample. Sorry for the silence on Monday and Tuesday, but here's the excuse: first, I'm writing (though obviously not this blog...) and there really is a point at which I feel that my brain may run out of words if I spread too many of them around. (My friend and wine guru Jeff Stai from Twisted Oak Winery says this will not happen--at least not to me--but I remain unconvinced). Second, I'm drinking rosés--lots of rosés. I had this notion I'd wait and post reviews of all of them at once. Then I thought: who am I kidding? It's summer. People need their rosé reviews NOW because no matter how many times I (or another wine writer) say rosés are good all year around, how many people pay attention to us? This summer's rosé reviews are all going to be local wines--and by local I mean wines made in Sonoma, Napa, and Mendocino counties where I am currently writing to you from deep within a belt of fog that refuses to leave and has given us temps in the fifties (that's the high...). Which is proof that rosés are good whatever the weather! 2009 A Donkey and Goat Grenache Rosé Isabel's Cuvée ($17.00, domaineLA) This was a lovely, weighty rosé--though not in the color or in the fruit profile, so I am left grasping for a way to describe why it feels so substantial in the mouth. There were juicy aromas of watermelon and strawberry, which (though faint) were very alluring. Warming the wine slightly from fridge temperature helps to draw these aromas out. There were more dry strawberry and melon notes in the flavors, with lots of minerality. Excellent QPR for a dry, flavorful pink wine that will please both red and white wine lovers. This mouthfilling wine will stand up well to spicier foods, like buffalo chicken wings or these delicious spicy chipotle shrimp tostadas. People have different ways of locating good wine values. Some shop the sales, while others haunt the box stores. A few turn their backs on their favorites--Pinot Noir, Cabernet Sauvignon, sparkling wine--and settle for something they're less fond of hoping it will suit their tastebuds. Look for grapes in all the wrong places. Certain regions become justifiably famous for producing a single grape--like Cabernet Sauvignon in Napa, or Pinot Noir in the Russian River Valley--and this means that growers can command the highest prices for their wines. But Cabernet Sauvignon is not the only grape grown in Napa Valley. Trust me on this. Napa Valley Sauvignon Blanc and Riesling (rare, but it's there!) are excellent and represent excellent value, too, because really, when is the last time you heard anybody ask "Do you have any Napa Riesling??" Here are a few of my recent finds that fit the "great grape in a surprising place" mantra for wine value. 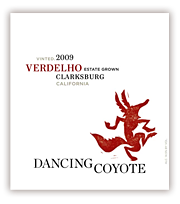 Verdelho, Albariño and Grüner Veltliner--From Clarksburg: Dancing Coyote may just be the greatest value wine producer you aren't drinking--yet. But if you see a cavorting coyote on a wine label, buy it and try it. You are going to be amazed at the taste and quality inside the bottle. Dancing Coyote is in Clarksburg, CA along the Sacramento River delta. I tasted a number of their wines (and reviewed their Petite Sirah a little while ago) and all of them were impressive. The whites were especially excellent QPR, however, and made with grapes that are normally associated with the Iberian Peninsula or Austria. The 2009 Dancing Coyote Verdelho (suggested retail, $10.99; available for $8-$14) was fresh and clean, and had well-balanced flavors of apple and lemonade with a bit of spritz. Try it with some spicy shrimp and chorizo kebabs for a fast weeknight supper. The 2009 Dancing Coyote Albariño (suggested retail $10.99; available for $8 -$10) had loads of green apple flavors and aromas, with citrus threaded through. And the 2009 Dancing Coyote Grüner Veltliner (suggested retail $10.99, and available through the winery) is a terrific example of domestic Grüner Veltliner, with typical grapefruit, lentil, and dust aromas and flavors. A bit more full and round than an Austrian example, this went well with pasta with ham and asparagus. Pinot Gris from Australia: When you think Pinot Gris you may think Alsace or even Italy--but not Australia. The 2009 Innocent Bystander Pinot Gris from Australia's Yarra Valley (suggested retail $15; available between $13 and $23) demands you reconsider this notion. It had a distinctive aroma profile of muted mandarin orange and nectarine. The flavors included notes notes of white nectarine, white peach, and Meyer lemon. Nicely balanced between fruit and acidity, this was an excellent QPR winner from Innocent Bystander. Chardonnay from Italy: When I think Chardonnay I think California or France--not Italy. 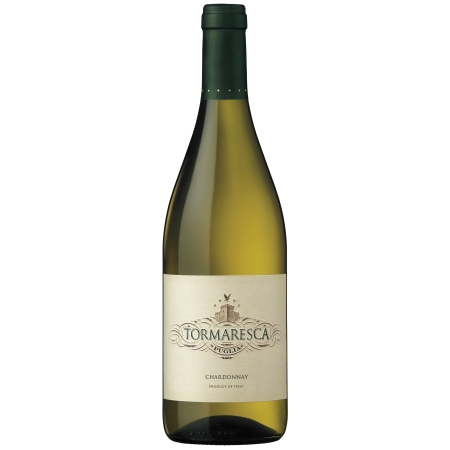 But Italy makes some beautiful Chardonnay, including the excellent QPR 2008 Tormaresca Chardonnay from Puglia (available for between $9 and $13). Straightforward, clean pear and apple aromas and flavors, with slight citrus inflections and no discernible oak, which was a nice change of pace. It was terrific with Ina Garten's Szechuan peanut noodles. Malbec from California: Americans have finally discovered Malbec, which is a good thing since it's a terrific red grape with roots that extend back into French viticultural history. Now, Malbec is most often associated with Argentina, but it's grown in California, too.The 2008 Red Rock Winery Malbec Reserve is an exceptional Malbec for the price (suggested retail $10.99; available for $8-$14), with a "blue" flavor profile of blueberries and huckleberries. The aromas are accented at first with white flowers, and a nice note of baking chocolate enters into the aftertaste. For $11? Excellent QPR. If the tomatoes aren't yet bursting on the vines where you are, it's only a matter of time. Tomatoes are an interesting wine pairing challenge. The acidity and sweet edge of fresh tomatoes can fight with some wines, and be overwhelmed by others. Enter Grechetto. 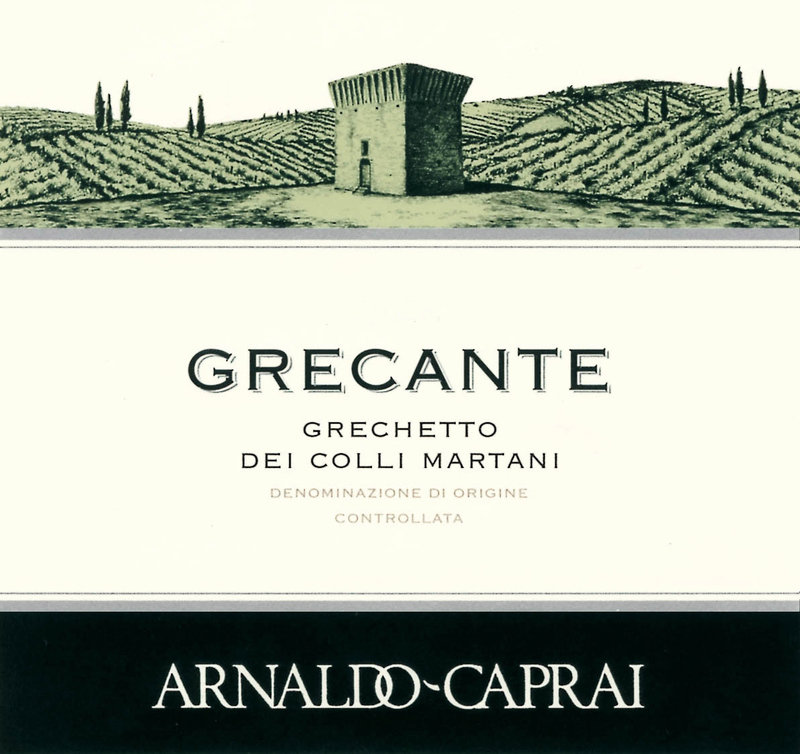 Grechetto has been grown in Umbria for centuries (I was corrected on this point when I drank an earlier vintage of this wine!). And it goes great with fresh tomato dishes, like caprese salad or this fantastic roasted cherry tomato pasta dish which uses barely blistered tomatoes to make a delicious sauce for spaghetti. 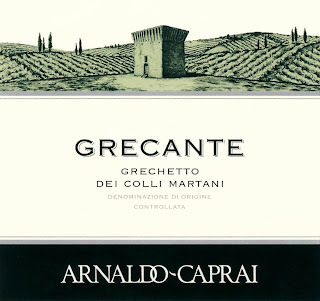 The 2008 Arnaldo-Caprai Grechetto Grecante (available for $16-$20) tasted quite different to me than the one that I drank in October 2008. That might be because that one had been in the bottle a bit longer, and was deeper in color and richer in taste as a result. This bottling--at least at this time--was much paler in color. The aromas reminded me of preserved lemons--the Moroccan kind, with salt. This aroma is echoed in the flavors, which take on savory herbal notes as well which will draw out the flavor of any herbs you use with your fresh tomatoes. Deliciously complex, dry, and not your ordinary summer white. Excellent QPR. 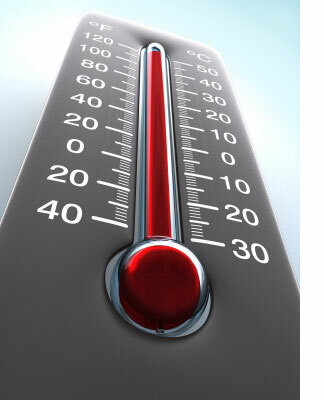 Sauvignon Blanc always has the effect of a liquid air conditioner on me. One cool glass and I can feel my core temperature drop and imagine a fresh breeze on my skin. It would be an understatement to say that there is a lot of Sauvignon Blanc in the market. Let's face it: there's tons of the stuff. It comes from nearly every region of the globe, and finding your way among the options can be a bit daunting. Happily, most bottles are eminently affordable, which makes it possible to experiment without facing bankruptcy. I must confess that I have a predilection (especially when the temperature rises) for Sauvignon Blancs from New Zealand, which are the epitome of refreshment. But don't forget that regions closer to home, like the Napa Valley, make excellent Sauvignon Blanc, too. Check out some of my favorites below. 2009 Kim Crawford Sauvignon Blanc (available for $12-$20) This classic Marlborough Sauvignon blank shouts "citrus!" with abundant grapefruit and lime notes, accented with grassy nuances. In some vintages, this wine can be a bit assertive for me, but the 2009 was delightfully balanced and has very good QPR. 2009 Nobilo Sauvignon Blanc Icon (suggested retail $22; available for $14-$25) Another New Zealand bottling, the very good QPR Nobilo has piercing aromas and flavors of lime zest, herbs, and green tea. If Crawford shouts "Citrus!" this wine shouts "Green!" even though its not grassy. The wine is quite complex, and it would be interesting to see how this would pair with Thanksgiving dinner come November, so pick up a few bottles while you're in the store. 2008 Franciscan Oakville Estate Sauvignon Blanc (suggested retail $17; available for $12-20). This lovely domestic example of Sauvignon Blanc is rounder, with nicely-balanced notes of Crenshaw melon, hay, and lemon pith. Fresh but robust enough to stand up to lemon-grilled chicken or a rich fish like Halibut. Not assertive, this wine shows the Napa sunshine in its warmer fruit profile. Very good QPR. 2009 Cupcake Vineyards Sauvignon Blanc (suggested retail $14; available for $7-13). My final recommendation is another affordable New Zealand example with excellent QPR. In this bottle you will find focused Meyer lemon, pink grapefruit, and lime aromas and flavors. Very refreshing, and excellent with fish, salads, and other summer fare. Don't be surprised if this becomes your leading contender for a summer house wine.